← App Obsession… Nike Training Club! 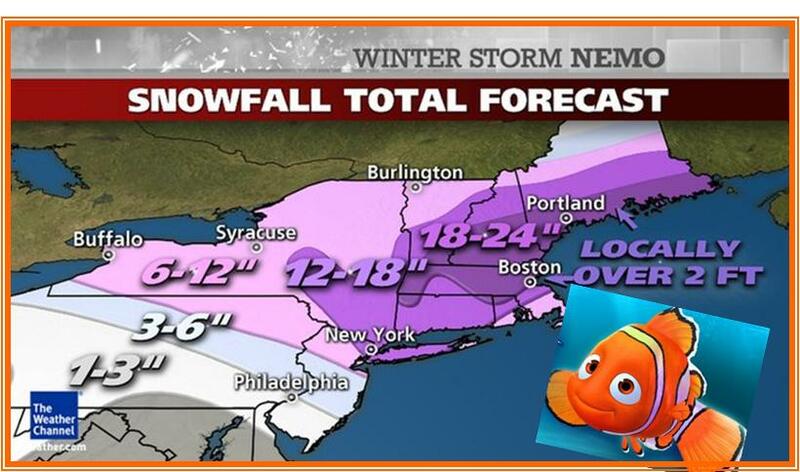 If you live in the northeast than you are probably hunkering down for Winter Storm Nemo! There is nothing better than comfort food in a snow storm or in this case a blizzard. My favorite comfort foods are lasagna and nachos, so I have created a recipe that combines both. 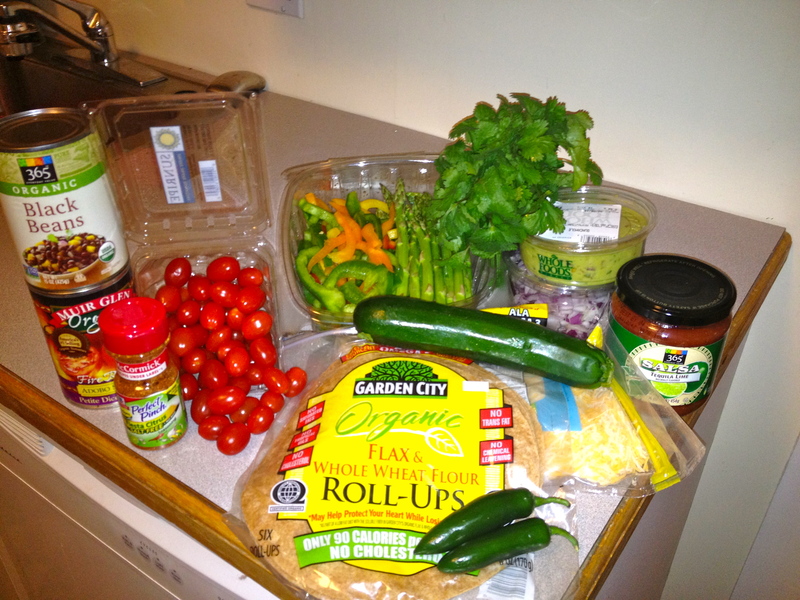 However this combination is packed with vegetables, beans and fiber and I have cut the fat but not the flavor! I first came across this idea from Nigella Lawson, she had a great recipe on Food Network.com. 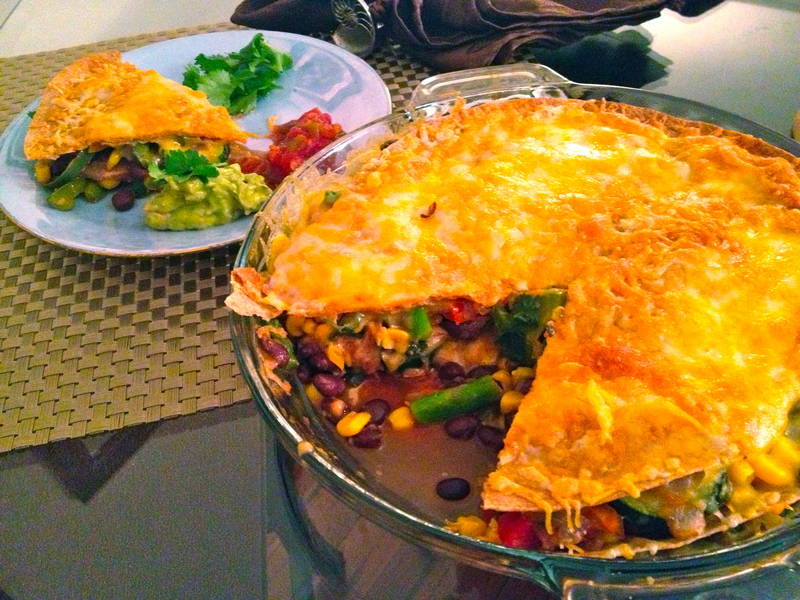 The recipe was yummy, but I thought this would be a great mode to sneak in extra vegetables, make it a meatless meal. I also wanted to cut a few corners so you can have it on the table in 35 minutes. These types of recipes are also a great to prepare ahead of time on, maybe even on your Prep-day. Recipes like there are great to experiment with difference spice mixes. They create a great deal of flavor and spice without adding lots of salt. 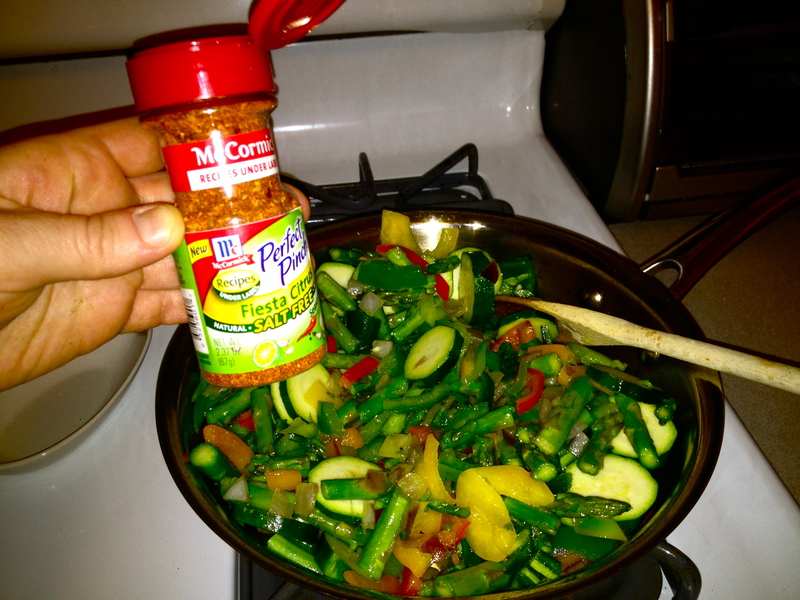 I had a perfect spice mix that I wanted to give a shot from McCormick. I was given a sample of McCormick‘s Perfect Pinch Fiesta Citrus at a recent nutrition conference. I thought the citrus flavor would add some brightness to the meal and a pop of flavor. I really enjoyed making this recipe because it was quick, easy and had lots of flavors The best part is, I was eating all those vegetables, but it certainly felt like comfort food! 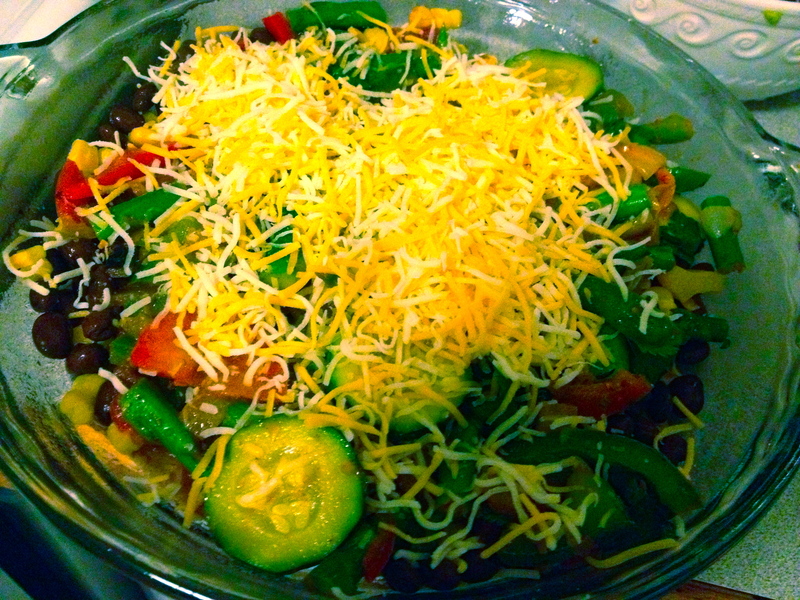 Ingredients: 15oz can black beans; 1/2 container of favorite salsa; 1 medium red onion chopped; 2 cups bell peppers chopped; 1 bundle of asparagus chopped; 1 zucchini sliced; 1 cup frozen sweet corn; 2 jalapeno peppers finely diced (deseed if you don’t like a lot of heat); mexican season mix (McCormick Perfect Pinch Fiesta Citrus); 1 cup shredded cheese; 4 whole wheat tortillas; 1 bundle of cilantro; 2 tbsp canola oil; guacamole for garnish. Step 1: Pre-heat the oven for 400 degrees. 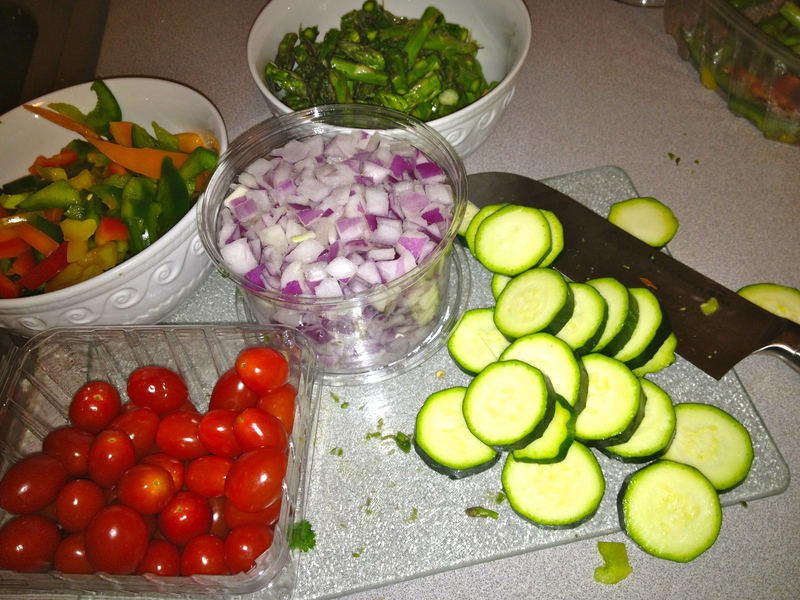 Chop, dice and slice your vegetables (onion, peppers, asparagus, zucchini, and jalapeno peppers). 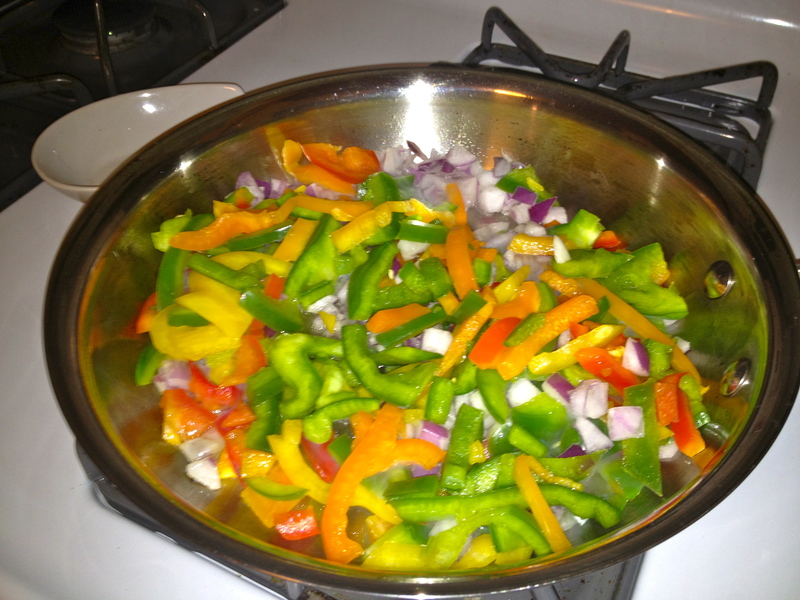 Step 2: In a hot pan add 2 Tbps canola oil with onion and peppers. Cook until onion begin to become translucent. Then add the rest of your vegetables to the pan to start to cook. Step 3: Add you seasoning and fishes off your vegetables by adding your cilantro. Step 4: Time to layer your lasagna. First spray the bottom of your pie pan with olive oil or non stick spray. 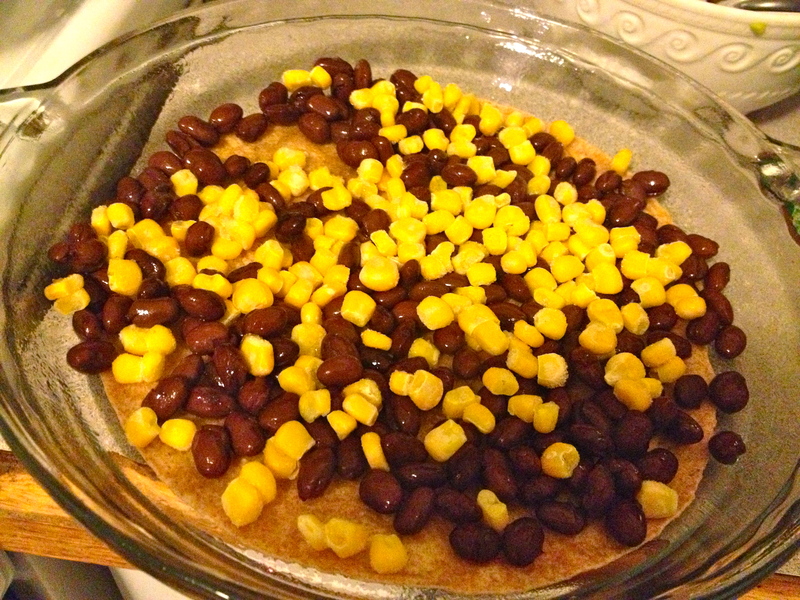 Then layer 1/3 of the black beans, corn and salsa. Step 5: Next add your cooked vegetable mixture and 1/3 of the cheese. Then add another tortilla. Repeat 3 times. 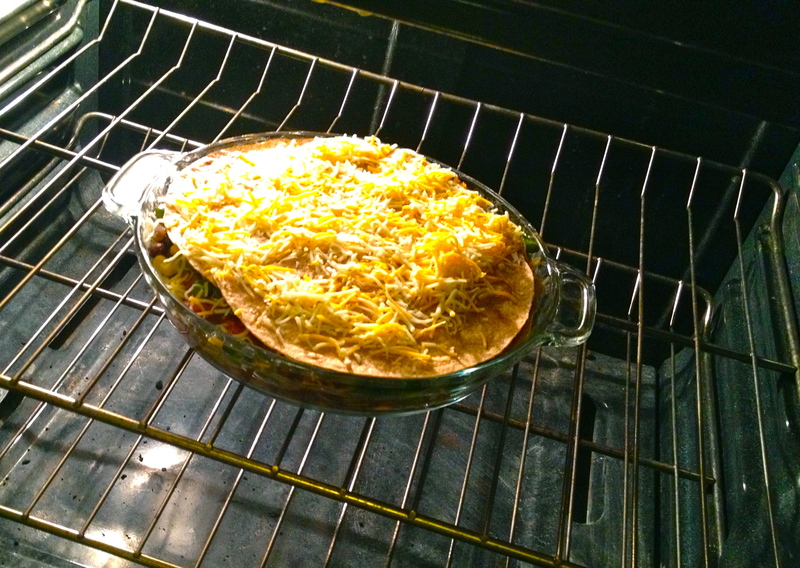 Step 6: Top with cheese and bake at 400 degrees for 15 minute, then broil for about 5 minutes to created a golden crust. Step 5: Serve with guacamole, salsa and enjoy. My challenge this week is to take your favorite or new recipe and see if you can turn it into a veggie packed and meatless meal. This entry was posted in Dinner, Lunch, Meatless Mondays!, Planning, Quick & Healthy, Uncategorized and tagged High Fiber, Meatless Monday, Mindless Eating, Quick, Small Plate, Social Eating, vegetables, Weight loss, wellness group. Bookmark the permalink.